On August 7th, 1970, seventeen year old Jonathan Jackson kidnapped Superior Court Judge Harold Haley from the Marin County Civic Center in San Rafael, California. The kidnapping was meant as a tool to negotiate the freedom of the Soledad Brothers, a trio of African-American inmates (George Jackson, Fleeta Drumgo, and John Clutchette) who were charged with the murder of a prison guard at Soledad Prison in California. George Jackson also happened to be the real brother of Jonathan Jackson. Jackson, heavily armed, took over the courtroom in Marin County, arming the defendants and taking Judge Haley, the prosecutor, and three female jurors hostage. In a firefight that broke out as they attempted to leave the scene, Judge Haley, the defendants, and Jonathan Jackson were killed. In the ensuing investigation, it was discovered that the shotgun used to kill Judge Haley had been purchased by Angela Davis a few days prior to the event. Furthermore, it was discovered that Davis was in collusion with one of the Soledad Brothers. Angela Davis is an activist and academic born in 1944 in Birmingham, Alabama. She received her Bachelor’s Degree from Brandeis University, her Masters from the University of California San Diego, and her PhD at Humboldt University in East Berlin. Davis rose to prominence in the 1960’s as a leader of the Communist Party USA with close relationships to the Black Panther Party and considerable involvement in the Civil Rights Movement. Her involvement with the Communist Party led to her be fired from her job as a professor at the University of California Los Angeles. After Davis was implicated in the murder of Judge Haley and a warrant was issued for her arrest, she went into hiding. A manhunt began for Davis and FBI director J. Edgar Hoover placed her on the FBI’s Ten Most Wanted Fugitive List, making her the third woman and 309th individual to be placed on that list. Davis was ca ptured and arrested on October 13th, 1970 when she was found by FBI agents at hotel in New York City. Her trial began on January 5th, 1971, where she declared her innocence before the Marin County Superior Court. Davis was held in the Women’s Detention Center during the duration of the trial. At first she was segregated from the other prisoners in solitary confinement. However, through the help of her lawyers, she was able to acquire a court order to remove her from the segregated area. Davis’s case spread across the nation, moving thousands of individuals to organize for her release. The Black People in Defense of Angela Davis was established in New York City by a committee of Black Writers. It then expanded to over 200 local chapters in the US, and 67 in other countries, by February of 1971. Celebrities also contributed to the campaign, including John Lennon and Yoko Ono who wrote the song “Angela”. After sixteen-months in incarceration, Davis was released on bail in 1972. Her $100,000 bail was paid for by a local dairy farmer and a wealthy business owner. Her legal defenses were also paid for in part by the United Presbyterian Church. This international movement and financial support of Davis demonstrated the position of power and prominence that she held in the Civil Rights Movement. The trial was then moved to Santa Clara County after the granting of a defense motion for change of venue. One June 4th, 1972, one year, seven months and twenty-two days since her initial arrest, Davis was found not guilty by an all-white jury. 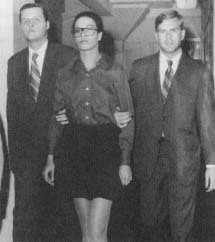 It was determined that Davis’s ownership of the guns was not enough to place responsibility on her for the kidnapping that killed Judge Haley. Judge Richard E. Arnason, who oversaw the case, read this passage before dismissing the panel. It comes from the essay of G.K. Chesterton titled “The Twelve Men” from the book “Tremendous Trifles” and was used to demonstrate the importance and power of the jury in determining the fate of defendants. This case marked a tremendous moment not only for Davis, but for the Civil Rights Movement and the Black Panther Party. The all white jury raised concerns for the defense as to the fairness of the trial. The lack of diversity led Davis’s attorneys to employ psychologists who helped the team analyze the jurors and identify those individuals who would most agree with their argument. After the verdict was announced, the jury was loudly cheered and later personally thanked by Davis. Davis went on to continue as an activist, author, and educator. She returned to teaching both at San Francisco State University and the University of California Santa Cruz. She is now retired but continues to travel the country giving speeches and remaining involved in activist movements. This court case represents a legal site of memory that countered the traditional expectations of a legal proceeding by an all white jury against a black defendant. Angela Davis both as an individual and a site of memory becomes a rallying point for activism and an empowering figurehead in the Civil Rights Movement. The incredible success of this court case, however, overshadows the countless other losses that were endured by black defendants at the time. For this one victory, there were many more losses wherein individuals faced unfair sentences, a fact that Davis is very aware of and mentions often in her discussions on the Prison Industrial Complex. This site of memory is both particular, in how it is remembered by Davis and her legal team, and universal in how it is remembered by the countless individuals who organized in her defense. It is also a processual site of memory as it continues to be analyzed by legal historians and students like myself to place its importance in the broader context of our history. Radosh, Ronald. “Jury Isn’t out on Angela Davis.” The Washington Times. The Washington Times, 11 Mar. 2012. Web. 12 Apr. 2017. Caldwell, Earl. “Angela Davis Acquitted on All Charges.” The New York Times. The New York Times, 5 June 1972. Web. 12 Apr. 2017. 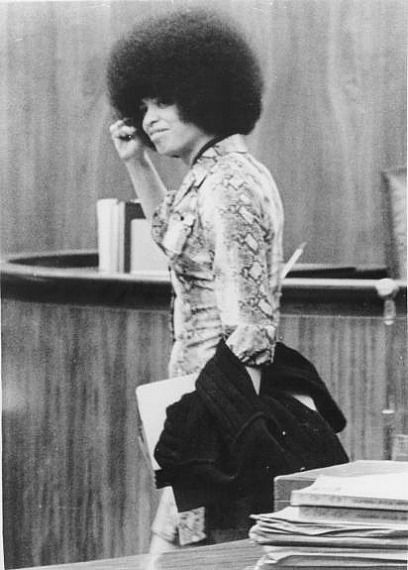 “Angela Davis Trial: 1972 – Davis Ridicules Case.” Brothers, Thomas, Soleded, and Mcclain. JRank Articles, n.d. Web. 12 Apr. 2017. I enjoyed reading your post because it was very similar to mine, which just focused on presenting a biography of Angela Davis. I briefly mentioned the Marin County Courthouse Incident in my post, but here you give a much broader overview of it. Reading your post gave me a much better understanding of how the incident played out, both during the kidnapping and in the years of court cases that followed. I found the passage by Judge Richard E. Arnason very interesting and I think it really adds to the mood you’re trying to capture in your website. The fact that Angela was acquitted by an all-white jury is definitely a shining moment in the history of the Black Power Movement and I think you did a wonderful job highlighting that within your site. To learn more about Angela Davis and the impact from her experience of being imprisoned, which is discussed above. Please read “The Prison Industrial Complex and Black Power” to learn about her coining of the term.